This shop page is dedicated to the DIY tools we use to create the projects I share here on the blog. Now, you can easily find our favorite DIY tools that have saved us thousands of dollars decorating our home. The DIY Tools I share on this page will help you tackle the same or similar projects. Take it from us – INVEST IN THE RIGHT DIY TOOLS FOR EVERY PROJECT! We have learned the hard way. In the beginning, we tried to get by with what you had, but the fact is that it cost us more money and more time in the end. As we try new tools and come to love them, I will update this page. Our tool box is constantly growing (which we aren’t mad about). 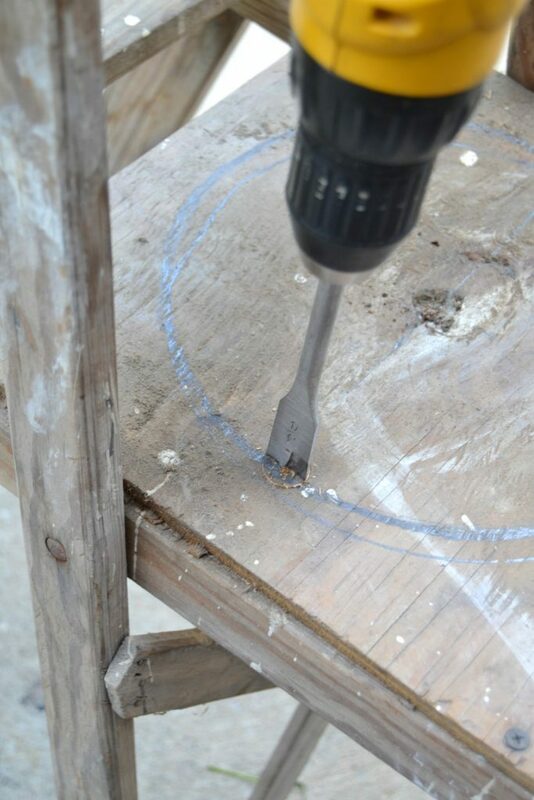 Drill: A cordless drill is the DIY tool that will be like a third hand when you are DIYing. We have a few drills now and use them for all kinds of things. The project you are working on will determine which drill bits you need. 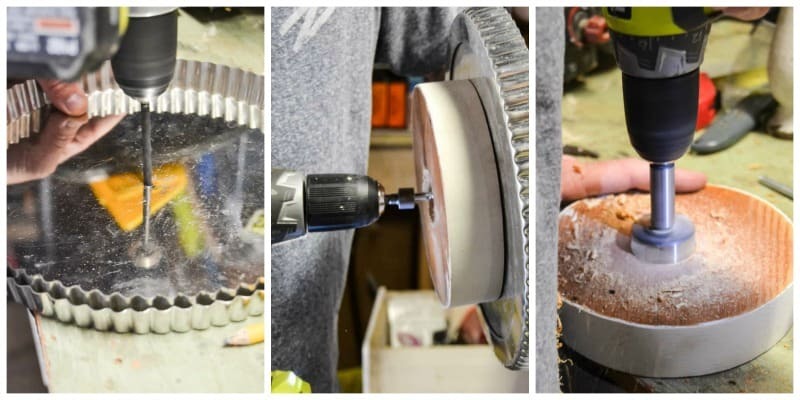 We use our drill and different bits for everything from drilling holes and screws to making our DIY candlesticks and our repurposed tiered stand. Orbital Sander: DIY tools have to consist of one of these. I constantly have this in my hands. I love to use it when I want to distress of piece of furniture like this bench or this hutch. If you liked a worn a weathered look, this tool is a must. Don’t pay high prices for antiques or rustic chic furniture – create your own. We also use this sander for prepping wood, stripping pieces or smoothing out rough edges on pieces we create. Miter Saw: Matt LOVES this tool. He uses it all the time. Just this past year, we upgraded his miter saw to a 10″ sliding model and he doesn’t know how he lived without it. 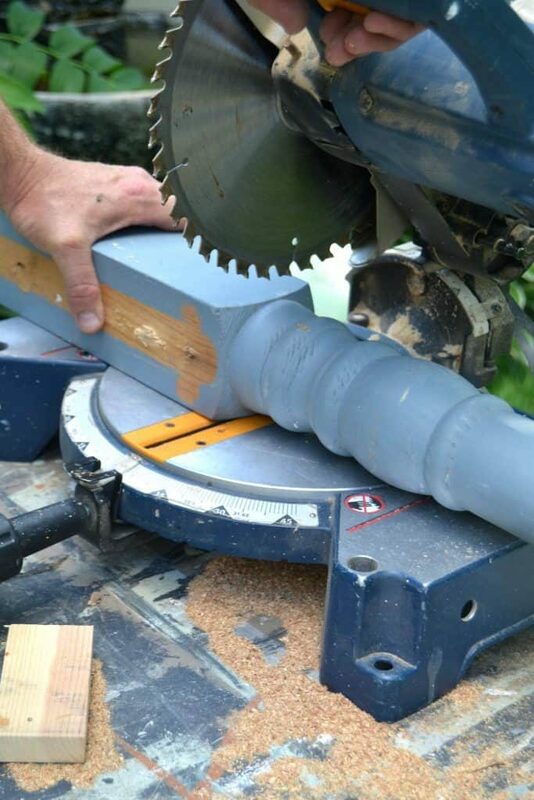 He uses the miter saw to cut boards, wood legs, small branches and to create angels. 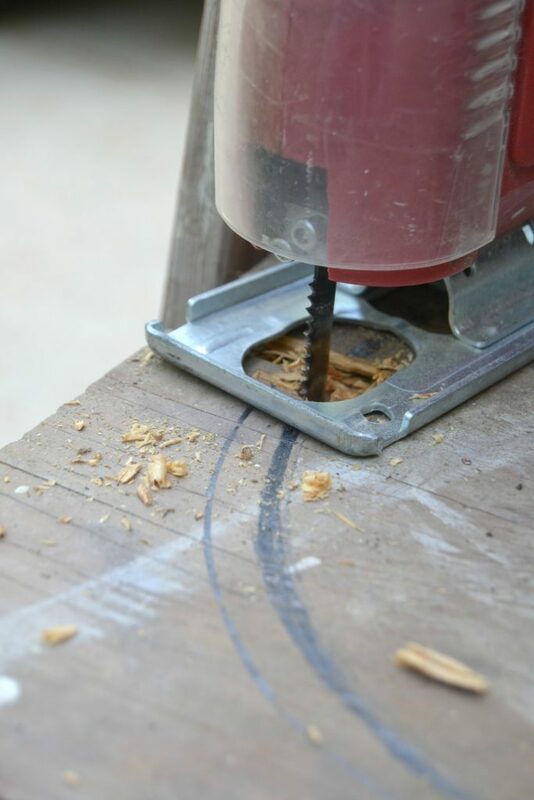 Circular Saw: We use the circular saw when cutting longer pieces of wood, flooring and to cut down furniture if we need to change the size of it. Table Saw: Matt’s favorite thing about this tool is that he can take huge sheets of plywood and cut it down to the size he needs. This has saved us a lot of money because we never had to buy the pre-cut wood and we get more wood for the price. 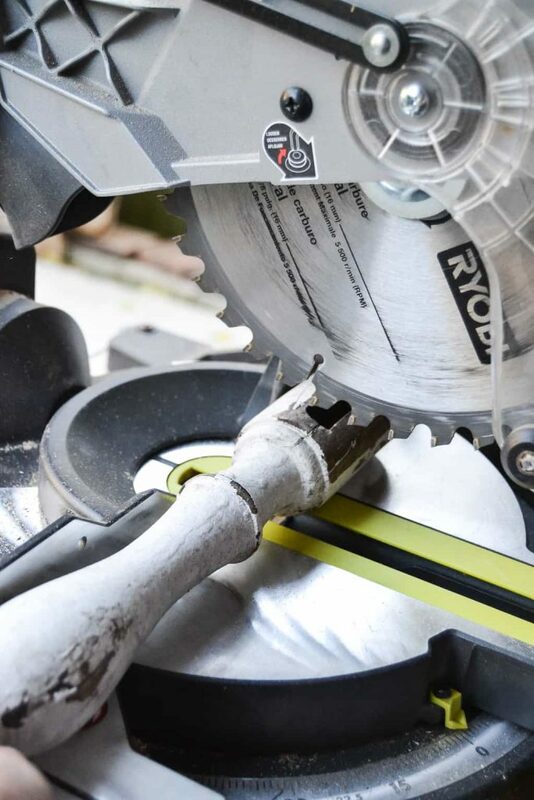 Reciprocating Saw: This saw is great for thicker things you need to cut. You can also cut drywall, 4×4 posts outside, pallets and pipes with it. We have also used it to cut off bolts that were so rusted on that they wouldn’t budge. Matt used it to cut the vintage theater chairs we hung on our entry wall. Air Compressor: We use our air compressor for the Brad & Finish Nailer below. There are other tools you can buy for the air compressor, but these are the two we use with it. Brad Nailer: We use the Brad Nailer for projects like frames, boxes, art and any other smaller projects. Finish Nailer: The Finish Nailer is used for bigger projects like remodeling and renovations. We used it on the FREE reclaimed wood wall we added to our back porch. Paint Brushes: Most of my DIY tools consist of paint brushes. I do most of the painting for our projects and having the right paint brush for the job makes a world of difference. Paint Brush Soap: This stuff works amazing! I never have to worry about ruining expensive paint brushes anymore because this soap gets them clean! Tape Measure: This is a no-brainer, but I wanted to add it in here for any newbie who is ready to start. We have a gazillion of these all around because we are constantly measuring for some kind of project. 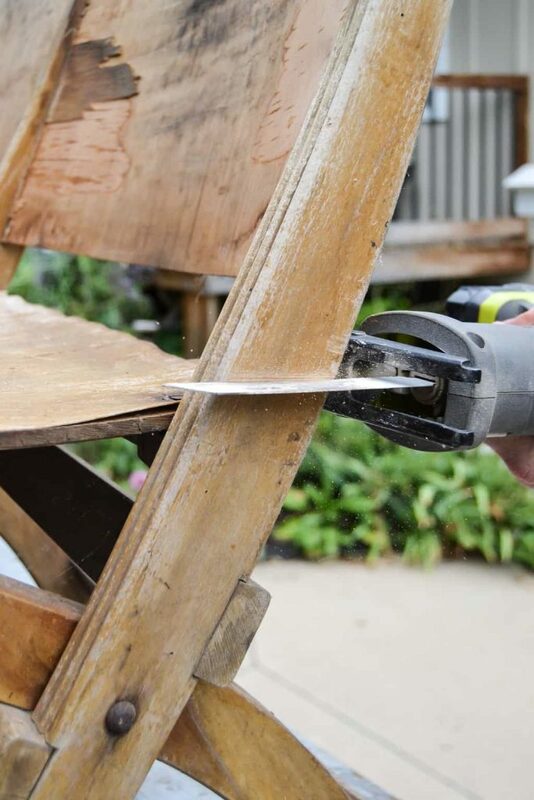 Staple Gun: I love to use the staple gun for upholstery projects. Although I can’t reupholster lots of things, the staple gun comes in handy for benches and not-so-hard upholstery projects. Square Tool: Matt loves this thing for making sure boards are square and creating proper angles. Cricut: This is another one of my favorites! I use this all the time to create homemade signs like my office sign and the fall sign I made on a vintage ironing board. Level: A level is used for making sure everything is straight – no matter what DIY project you are doing. Jigsaw: A jigsaw comes in handy for rounded cuts and more detailed cuts. Metal Sheers: I love repurposing old metal and I have found some metal pieces at yard sales that we were able to cut and create into new pieces. Metal sheers are great for those projects. Make sure you wear tough gloves when you are cutting metal. Matt used them to cut the metal around the barn wood arrow that still hangs in our entry. 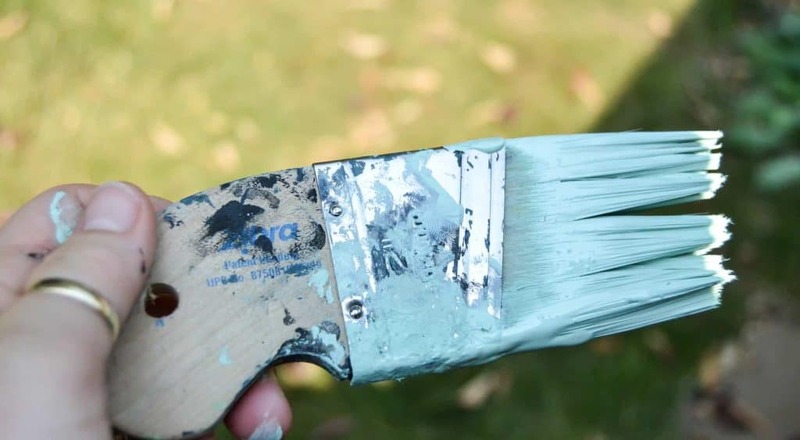 Painter’s Tape: I don’t use painter’s tape when I am trimming walls, but I have used it when I am making signs and other small projects. Drop Cloths: These come in handy not only when you are painting, but when you do any messy project that you want to contain. Paint Sprayer: A paint sprayer will change your painting game. There are many projects that I like to paint by hand, but there are times when I want the sprayer to speed up the process. 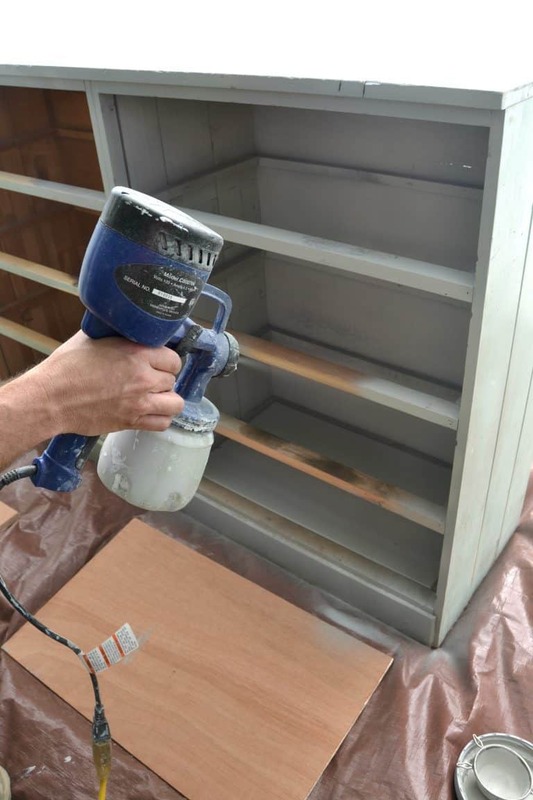 Spray Shelter: The spray shelter is nice because it contains all the over-spray from the paint sprayer or cans of spray paint. PIN THIS DIY Tools POST! Check out how we use these DIY tools in more projects HERE.